The stock market is taking a hammering again, following the UK’s decision to leave the EU. Now, you might be wondering whether markets are over-reacting. It wasn’t a surprise vote. This didn’t just happen. 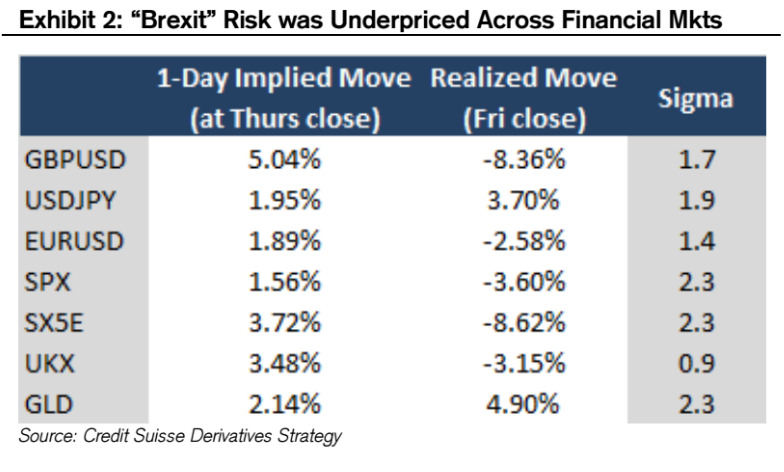 The table below comes from Mandy Xu at Credit Suisse helps put all of the market moves over the past few days in to context. 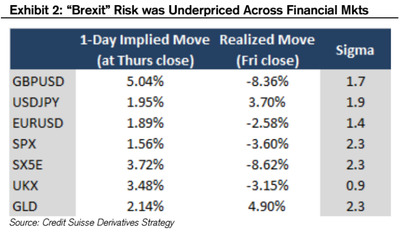 It shows how risk was priced heading into the Brexit vote. Basically, everyone underestimated the chaos on Friday. The note adds that cross-asset correlations are now at extremes. What that means in practical terms is that volatility is spreading from one asset class to another, from the S&P to sterling to sovereign debt to investment-grade debt to oil and gold. The chart below shows the co-movement between equity volatility and the other asset class volatility. To put the numbers in context, a volatility spillover number of 90% for an asset class means that if volatility increases in that asset, 90% of the time, equity volatility will also increase. Where the correlation is greater than 75%, the box is in red. There are lots of red boxes.